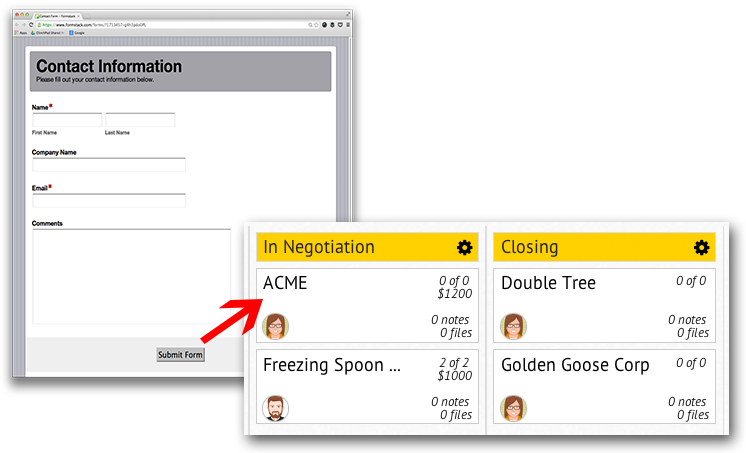 Capture all the leads submitted in a Formstack form directly in our sales crm software. Formstack is a WYSIWYG online form builder. Formstack helps you create online forms to gather information and to manage incoming sales leads without having to write a single line of code. ClinchPad is an alternative to traditional CRM software built for small teams to track sales leads and to improve sales team collaboration. Do you use Formstack to keep track of inbound sales leads? Then it's time for you to automate the task of managing the sales pipeline by taking advantage of ClinchPad's integration with Formstack! Forms in the Contact Us page or Request For Quote page are a high quality source of leads for every organization. Formstack helps you create these forms without the need for any technical knowledge. Instead of letting these sales leads go stale in an email inbox, why not hook them up directly to a CRM software and start managing leads right away? Our integration with Formstack lays the foundation for sales force automation in your organization. Now, instead of re-entering each and every incoming sales lead into ClinchPad, you can just map the form fields to the form fields of our online sale CRM. That isn't all! You can even integrate multiple forms with ClinchPad sales CRM and assign a specific user to leads generated from a particular form. There isn't a better way to keep your sales funnel loaded at the top! Sign up for accounts on both Formstack and ClinchPad if you don't have them already. Create an form to capture leads on Formstack. Follow the instructions in this support article on integrating ClinchPad with Formstack. You're done! Now anytime a Formstack form is submitted, it'll appear as a lead in ClinchPad.